Lose That Girl: RATE IT! 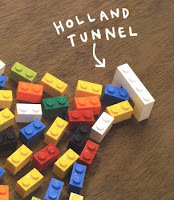 I Lego NY! RATE IT! I Lego NY! RATE IT! Peeps Takin' Over! Let's just face it...Lego is taking over the world, or at least the pop culture part of it. We've seen Lego pop stars, Lego boomboxes, Lego artwork...now the plastic blocks are taking a bite out of the Big Apple. 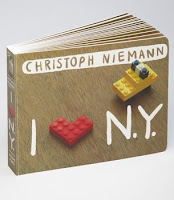 The I Lego NY booklet, crafted by Cristoph Niemann is a treasure trove of Manhattan favourites. Taxis, famous architecture, food, even whimsical glimpses of the idiosyncrasies that plague city dwellers (stepping in chewing gum, anyone? )...all make this book a joy to behold. New York City as a tiny toy-town. Love it!